A trigger finger frequently manifests as a blockage of a finger that usually occurs in the morning (Fig. 6). Fluid accumulation around the flexor tendon or a thickening of the actual flexor tendon may cause a debilitating pain at the base of the finger. Patients often report pain in the first phalanx bone or the first finger joint (PIP joint). It is important to note that trigger fingers may occur simultaneously with carpal tunnel syndrome! Therefore this is always checked and/or further investigated by means of a needle electrode test (EMG). In this case the first treatment involves anti-inflammatory treatment with rest, physiotherapy, infiltration with cortisone, or anti-inflammatory medication taken orally. An operation is usually performed if there is already a blockage of the fingers. 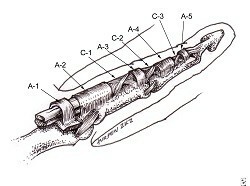 The procedure, performed under local anaesthetic, involves inserting a small band (A1 pulley) through an incision at the base of the finger (Fig. 7). After the operation a small compression bandage is applied around the finger and the patient is immediately encouraged to move the finger. We recommend your wound be checked by your GP one day after the operation. He or she can schedule daily care of the wound and remove the stitches after around ten days. 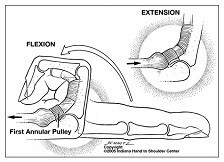 Physiotherapy is incorporated if insufficient flexibility is regained after surgery.